Explosive, Brutal, Hilarious, Unforgiving, Fist Pumping, Jaw Dropping. These are the words I’m using for Gemina. 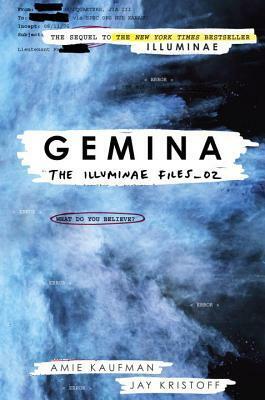 I started Gemina on Thursday and stayed up last night until 3 a.m. finishing it because I COULD NOT STOP. It actually took me a few pages to get back into the groove of the style and feel like I had a good grasp of the situation, but I’m not calling that a bad thing. The amazing style that makes this book INCREDIBLE just takes a minute to lock into. This is brutal and unforgiving and heart stopping, but Kristoff and Kaufman add this perfect balance of humor all over the place that is just genius. Keeps the situation high tension and brutal, but takes just enough edge off that you’re heart isn’t going to explode. But it’s the format, people. Not only does it make this a cinematic read, but adds surprising emotion. I definitely choked up a few times when I turned the page and read the words the way they were presented. Also, there are several pages of read in this that I felt were absolutely brilliant. It’s a spoiler to say why, but while I was engrossed in the story, I was also absolutely delighted by how cool the format was making it. I’m extremely nervous. Illuminae and Gemina were nothing short of amazing. I’m so nervous for how the third book will wrap up. I’m going in with mega high expectations and I absolutely can’t wait. I tip my hat to Kristoff and Kaufman for imagining up and executing such a brilliant and brutal reading experience.